Fifa’s World Cup, and the political game ! … | Notes From America ! Every four years, the month of June becomes a month of magic and spectacle around the world. It’s FIFA World Cup time! And for millions of people around the world, and a few lonely Americans, football is the only game in town. It is for some a religion and a divine gift from above. In Egypt, shops, churches, and mosques close, at work people use all their sick days to stay home to watch the games, coffee shops are open all day and nights for the game, only time where the military regime let people in gathered and watching the game in public squares and coffee shops. People in Muslim countries even postpone their daily prayers until after the game. God can wait, but goals won’t. 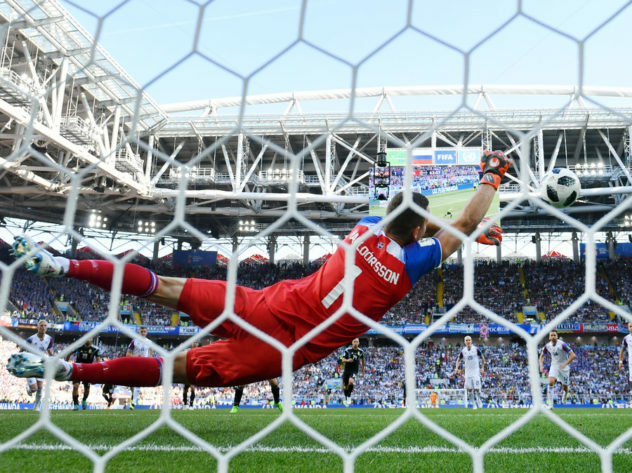 Sports and politics are no longer separate entities, but are merging into big business and big political spectacles, Russia spent more than $14 billions in World Cup, 2018, Brazil spent more than $15 billions, 2014 The purity of the beautiful game has been stained by political agendas of sports organizations, too. The NFL brought politics into sports by “honoring the flag,” using military color guards and making the singing of the national anthem a mainstay of a sporting event. Using these symbols, Trump and NFL mafia owners are exploiting the popularity of sports to inject a brand of fascist patriotism onto the field where no one is allowed to “take a knee” or opt out. President Trump champions this kind of blind patriotism, suggesting at the North Korean summit that Americans should “sit up in attention like Kim’s.” Similarly, Hitler used the 1936 Olympics in Berlin to propagate Germen supremacy. 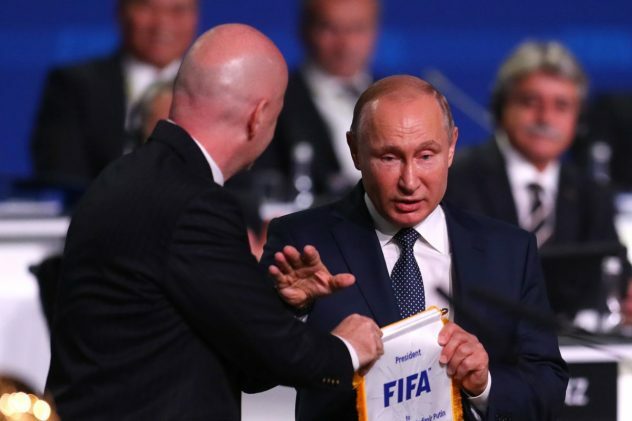 The 2018 World Cup reflects this blending of politics and sports as this football spectacle takes place in Russia with President Putin opening the FIFA World Cup. Sadly, the beautiful game has been stained by corruption, money, corporate sponsorship , political propaganda and VRA (Video-assisted Referee) technology that is ruining the spontaneity and fluidity of the game. Although FIFA wont allow players to display any political vies or expressing, according to Fifa’s disciplinary code, article 54 states that “anyone who provokes the general public during a match will be suspended for two matches and sanctioned with minimum fine of 5,000 Swiss francs. The Independent report that ”Granit Xhaka and Xherdan Shaqiri risk receiving a two-game World Cup ban for their goal celebrations in Switzerland’s last-gasp victory over Serbia on Friday night, with Fifa opening an investigation over a potential breach of their political and offensive messages regulation. In 2008, Egyptian player three times African player of the year winner, AbouTricka was booked by official for displaying a message of support to Gaza during African cup match. The midfielder was booked for his actions. “CAF officials said Aboutrika had been warned after the incident for breaching regulations by displaying political slogans.” Players aren’t allowed to express their political view and use their celebrity’s states for social or political activism, however dictators are using World Cup as a platform for Image makeover. Sadly, the beautiful game has been stained by dirty politics and corruption and became a platform for dictators’ image makeover. 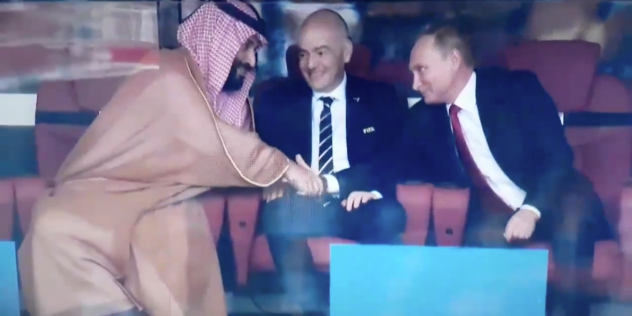 At the opening game, Putin and Prince Ben Salman of the KSA took a break from managing the massacres and slaughter in Syria and Yemen to sit next to head of FIFA, President Gianni Infantino, to exchange smiles and jabs. To me, it was one of the ugliest images of the World Cup so far, except for the haircut of the Brazilian superstar, Neymar. Then former FIFA president Sepp Blatter, the disgraced ex-boss, showed up at the World Cup on Tuesday as a guest of Russia‘s President Vladimir Putin. World soccer fans thought they were rid of this banned and shamed leader, who left as head of FIFA cue to corruption including bribery. Egyptian superstar Mohamed Salah got himself in trouble for posting with The Chechen leader Ramzan Kadyrov, who has been accused of human rights violations like disappearances and torture, Mr. Kadyrov hosted teams from the Middle East in luxury hotels. Providing them with Ramadan meals, Mosques and stadium that was built and named after his father. To post Netanyahu image while is committing a massacre in Gaza, Israel tried to lure Argentina team to play a friendly game in the disputed city of Jerusalem. which the Argentinian Football Association rejected under pressure from activists around the world. Egyptian President General Abdelfattah el-Sisi, who is turning the Egyptian Football Association into his own club, is controlling football on the field and off the field, is now jumping on the World Cup wagon, inviting the team for photo op and posting the images, sending his aides, journalists, well-known actors and dancers, loyalists and parliament members with the team. In one of the infamous events of the 2012 soccer season, at least 74 fans, many of them fans of the national club Al-Ahly who also played a major role in the January revolution, were killed in a game in Port Said, Egypt. Egyptian security allegedly allowed violence to escalate among rival fans and trapped fans inside the locked doors of the stadium, all-time best Egyptian soccer players, Mohammed AbouTrika, . AbouTrika brought more victories to Egypt than the Military for 70 years, he was chased out of the country after not falling out of elSisi favorers, now accused of being a terrorist and sympathizer of the Muslim Brotherhood. General El-Sisi is now jumping on the World Cup wagon, inviting the team for photo op and posting the images, sending his aides, journalists, well-known actors and dancers, loyalists and parliament members with the team. Their purpose is not so much to support the team, but for propaganda, waving his picture along with the Egyptian flag! Fans look forward to enjoying the style and passion of the world’s game, and for a few hours, escaping the politics of this polarized world. 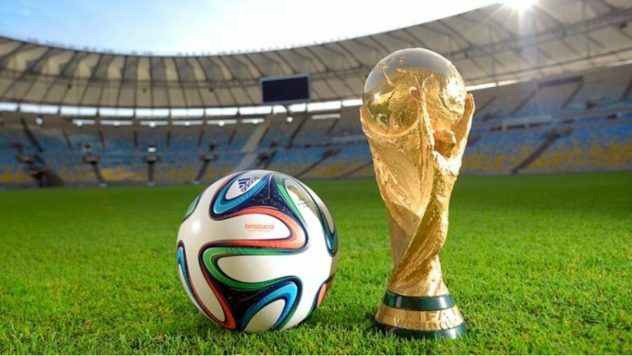 The millions of people, according to the FIFA website more than one billion fans tuned in to watch the World Cup Final in Brazil, no longer can separate the hostilities of politics from those on the football pitch. They can’t simply enjoy the “David and Goliath” matchups of teams like Uruguay, Costa Rica, Panama, or Tunisia with colonial powerhouses like England, France and Spain. The game that millions enjoy, where representing your country should be the highest goal, where the clash is about cultural style, where the western power yet to dominate, where people and players proudly singing their national anthem. FIFA World Cup, every four years, everything is put on the line, is marred. Now it has become a platform for political propaganda and image makeovers for dictators, an ugly stain on the beautiful game.